The built-up curb ramp projects into the access aisle. 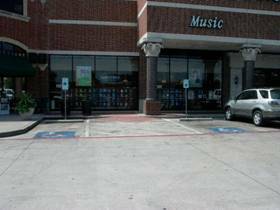 The accessible parking space and access aisle is not level in all directions. 4.6.3 Parking Spaces. ...Parking spaces and access aisles shall be level with surface slopes not exceeding 1:50 (2%) in all directions. facility entrance and shall comply with 4.3. 4.7.5 Sides of Curb Ramps. 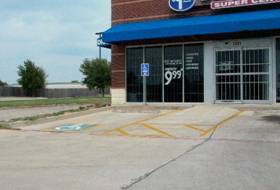 If a curb ramp is located where pedestrians must walk across the ramp, or where it is not protected by handrails or guardrails, it shall have flared sides; the maximum slope of the flare shall be 1:10 (see Fig. 12(a)). 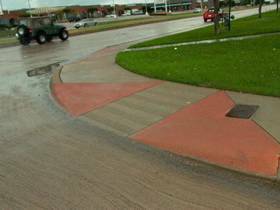 Curb ramps with returned curbs may be used where pedestrians would not normally walk across the ramp. 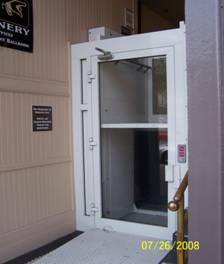 Adequate maneuvering clearance is not provided at doors, including doors to accessible toilet stalls. 4.13.6 Maneuvering Clearances at Doors. Minimum maneuvering clearances at doors that are not automatic or power-assisted shall be as shown in Fig. 25. The floor or ground area within the required clearances shall be level and clear. 4.17.5* Doors. Toilet stall doors, including door hardware, shall comply with 4.13. If toilet stall approach is from the latch side of the stall door, clearance between the door side of the stall and any obstruction may be reduced to a minimum of 42 in (1065 mm).